I hope everyone survived Halloween on a Monday. I think I’m still recovering! Now that it’s behind us, we can look forward to Thanksgiving. Those who know me and know my back story know exactly why I absolutely do not look forward to Thanksgiving, and yet, somehow this year I am. My darling Josie and her family will be visiting and instead of my standard (wanting to stay in bed under the covers until the day has passed), I am counting down the days in a good way. 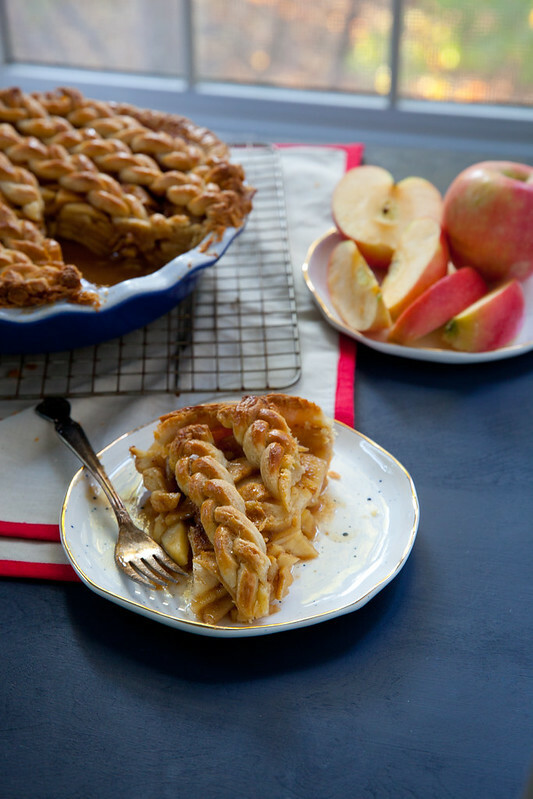 We’re beginning to plan our menu as I know many of you are as well, which brings me to the topic at hand – apple pie. In the past though I have always enjoyed it overall, I haven’t had very strong feelings about specific apple pie recipes. I have tried many. All have been similar, all have been good. Apple pie is apple pie is apple pie, or so I thought. However, that just didn’t sit well with me. I felt that there had to be some way to level up my apple pie game. In the past, I have seen and heard of many versions of caramel apple pie and while I do love caramel apples, they seemed too much. I worried the apples would be overpowered by the presence of the caramel when they should really be the focus, or that the pie would be toothache-ingly sweet. Not so with this version. It has so much going for it. A nice dark homemade caramel sauce paired with a sprinkle of coarse salt is just the thing to enhance the flavor of the apples without taking center stage. To me, this still tasted like classic apple pie but also WAY BETTER. Yeah, we leveled up. To make the caramel, combine 1 cup of the granulated sugar in a medium sauce pan with the water. Cook over medium-low heat just until the sugar is dissolved. Add the butter to the pan and bring the mixture to a low boil. Continue to cook over medium heat, stirring occasionally, until the mixture has turned a deep golden brown. Remove from the heat and slowly add the heavy cream, whisking in each small addition fully before adding more, and being very careful as the mixture bubbles and steams. Stir in the vanilla and set aside to cool. Juice the lemons into a large bowl. Core, peel, and thinly slice the apples, adding the slices to the bowl as you go. Toss lightly, dredging the apples in the lemon juice. Sprinkle with the remaining 2 tablespoons of sugar. Set aside to soften slightly and release some of the juices, about 20-30 minutes. In a large bowl, sprinkle the bitters over the raw sugar. Add the cinnamon, allspice, nutmeg, pepper, kosher salt, and flour, and mix well. Add the apple slices to the sugar-spice mixture, leaving behind any excess juices in the bowl from the apple slices. Fold together gently to evenly distribute the spice mixture. Line the bottom of a 9-inch pie plate with pie dough, trimming the edges as needed. Tightly layer the apples in the shell so that there are minimal gaps. Pour a generous ½ cup of the caramel sauce evenly over the apples. (You will have leftover caramel sauce – a travesty, I know.) Sprinkle with the ¼ teaspoon of the flake salt. 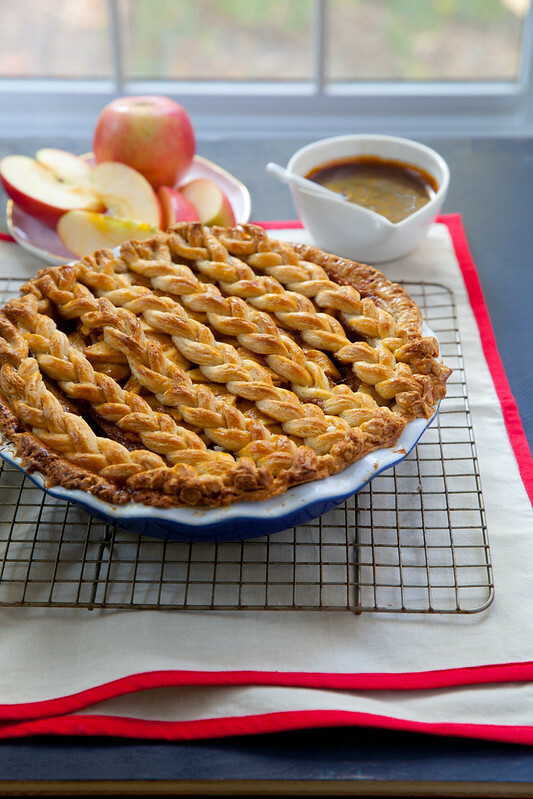 Assemble a lattice top on the crust, or a row of braids. Trim and crimp the edges as desired. Chill the pie in the refrigerator for 10-15 minutes to set the pastry. Meanwhile, place an oven rack in the upper middle position and heat the oven to 400˚ F. Brush the top of the pie with egg was to coat and sprinkle with the desired amount of demerara sugar and flake sea salt. Place on a rimmed baking sheet and bake 20-25 minutes or until the pastry is set and beginning to brown. Reduce the oven temperature to 375˚ F and continue to bake until the pastry is a deep golden brown and the juices are bubbling, 30-35 more minutes. Transfer to a wire rack to cool completely. *Note: To make a braided crust as picture, I recommend making a triple batch of pie dough. Use one third for the pastry shell base and the remaining two thirds for the braided top. You need plenty of dough to work with to ensure enough of the proper length of strips for braiding.